vitum medicinus ::: a life of medicine: Mmmm, sweet black nectar of bean. My coffee addiction (come on; call it what it is) began in college. It only intensified when I started med school. 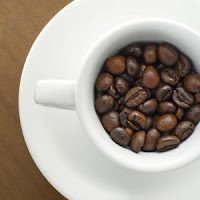 But just before Step 1, I realized that a day without coffee meant horrid headaches, and when I drank it, I felt jittery and occasionally had heart palpitations. I decided that caffeine-induced arrhythmias were bad, so I slowly cut back. I got through my month of boards prep mostly on decaf (I can't seem to break the psychological cravings and I like the taste). I can go days now and not have coffee, and everything is really okay! ;) But to be fair, I'm an MSTP student, and I only did one M3 clerkship this summer before starting my PhD; I'm sure that if I had to finish third year right now, I'd be a total caffeine fiend once again. The best part of this addiction is that it comes with built in "study breaks." Everyone needs a trip to the loo now and then. Pick up a pound from Peet's Coffee and Tea (www.peets.com) and you will become hooked for life. Surrender, Vitum, to the dark side! We have cookies!